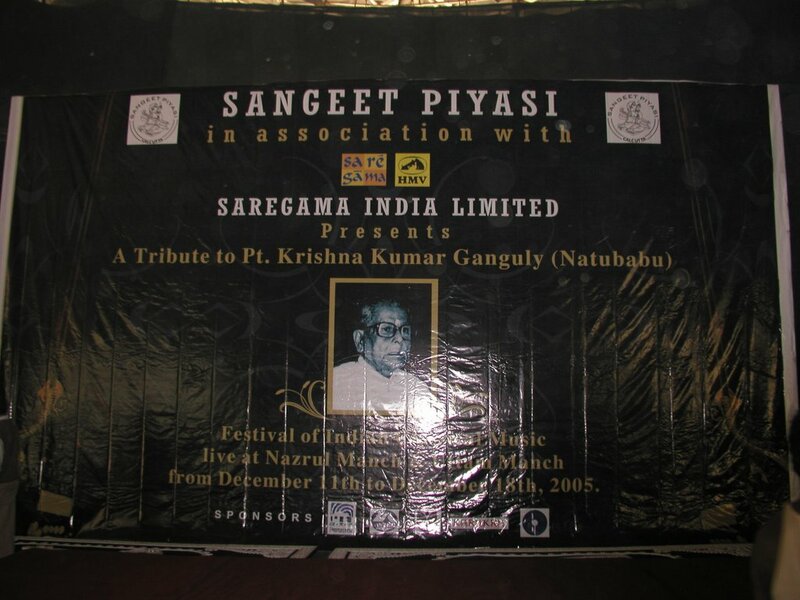 Notes on Music Creation, Education and Performance: Sangeet Piyasi Festival Day 1...Wow! “Wow”…..it is all I can think as I sit here the morning after one of the most incredible nights a student of the tabla could ever hope to spend. I ate a nice breakfast and then walked to the Nazrul manch at 8 a.m. I saw George on my way and we went in together. He told me he did not sleep last night because he was so excited. I thought to myself, ‘He’ll never make it through the day’. All I could think of was pacing myself to be able to sit through 12 hours of Indian Classical music. Even though I felt happy to be there, I was not filled with the anticipation and adrenaline that I saw in George. After all, I was familiar with the names on the bill, but I really did not know who I was about to see, so keeping things business-like was about all I could do. That is all over this morning. 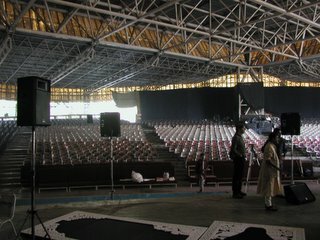 Walking into the Nazrul manch was pretty close to what I expected. 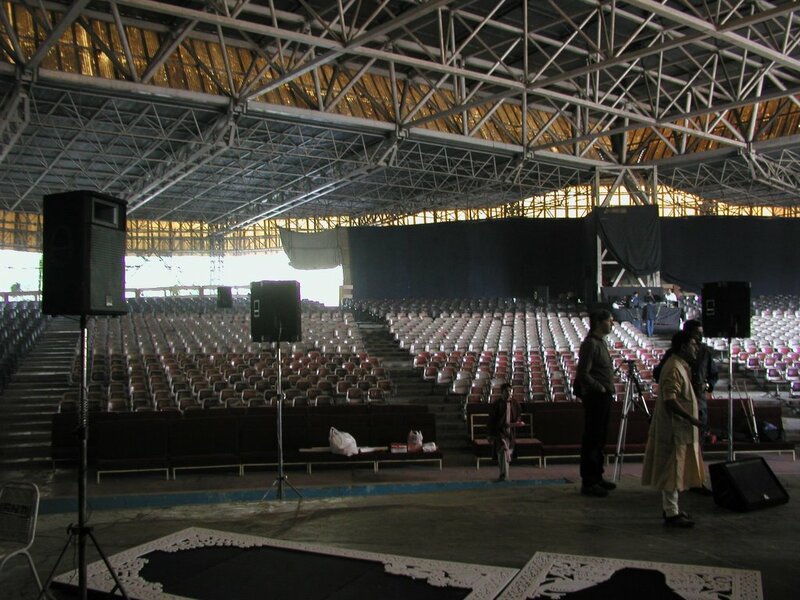 It is a big open-air amphitheater that sits about 3000. 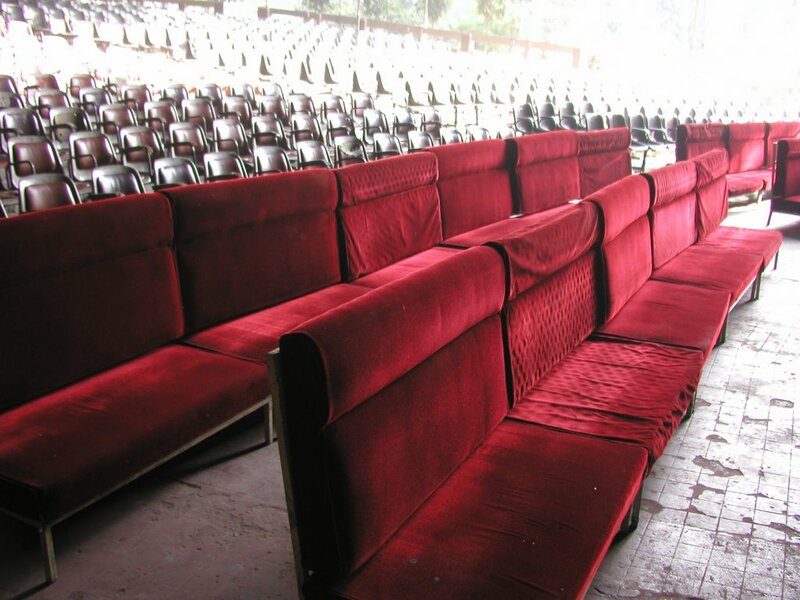 The first two rows were these red plush velvet sofas that looked like they came straight out of a speakeasy. This is where I would spend most of the day. 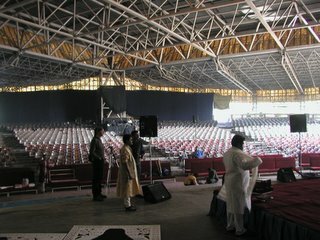 They had a nice sound system, but like most things in India, it was just a little different than I was used to. 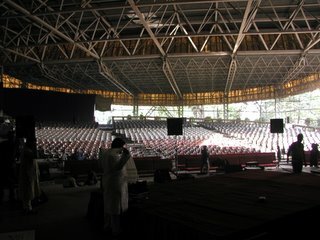 All the speakers, about 15 in total were evenly distributed throughout the amphitheater on basic speaker stands that stood just about 10 feet tall, so 5 speakers were spread out evenly across the front of the stage, then another five were spread about 20 rows up, and then the rest were put into corners and against the walls. It was like every section had their own personal speaker. It made some of the seats obsolete and blocked certain views, but once the sound check began, I could tell that they knew what they were doing. There were no problems with feedback, and I have never heard Indian instruments sound so good. It was about two hours till the festival would kick off and George immediately got assigned to check people in as they came. I walked around looking for things to do and got my usual smiles and nods. I got to help with some stuff, but everything looked pretty taken care of. Samarji looked excited, I guess everyone was. Things seemed to be falling into place. I took a seat in the front row and watched it all come together. 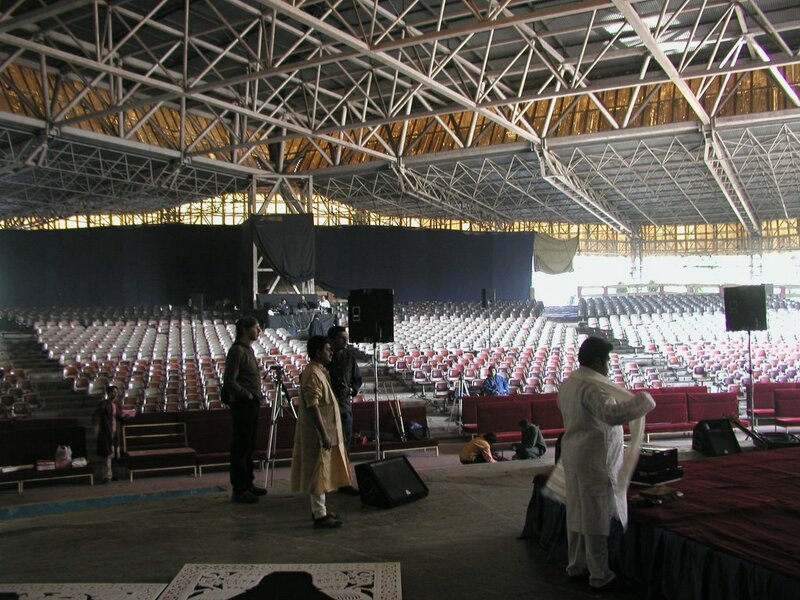 True to what I have come to know as Indian standard time (IST) the concert got going about a half hour late and there was an hour and a half of ceremony before the music began. They gave away some scholarships, paid respect to some of the oldest living exponents of Indian classical music, and finally paid their respects to Pt. 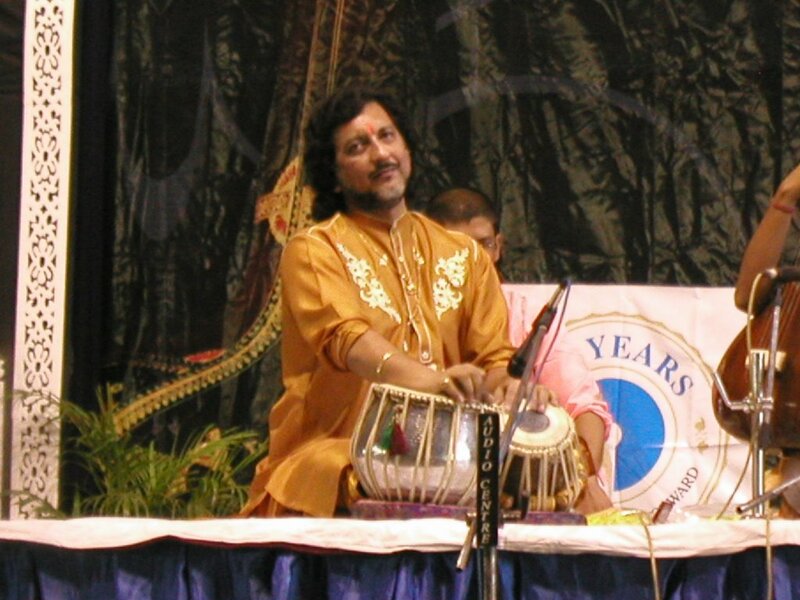 Krishna Ganguly, the late tabla maestro for whom this festival was put together. This year marks 100 years since his birth. He was known for never taking money for performances or lessons because he did not want to commercialize the Gods that blessed him with his talents. I have heard that none of the performers are taking any money for this festival in honor of him. 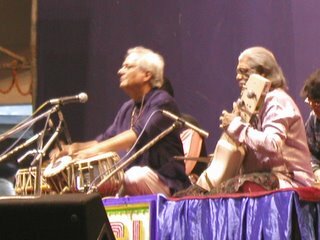 There were 3 tabla solos flanked by vocal performances all of which were accompanied by tabla masters. 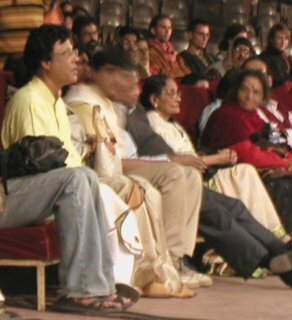 What was almost as great to see as the performances themselves were all the tabla maestros sitting in the front row watching their counterparts up on stage. The interaction between the players was incredible. A maestro would sit on stage and dedicate certain compositions to their contemporaries sitting in front of them and the artists in the front would keep the tal and be the first to cheer, clap and give praise. I could tell they were all propelling each other to play at the top of their game. It was as if they were all playing for each other and we were there to watch the tigers roar. 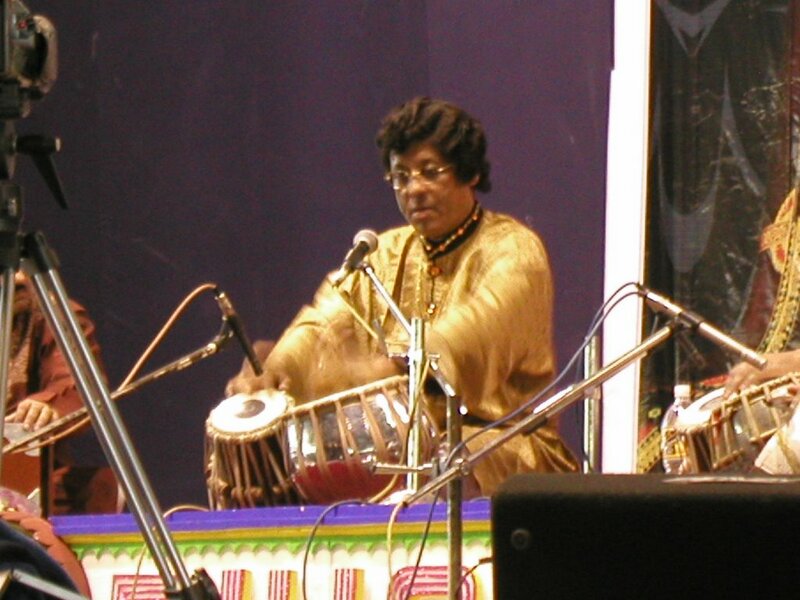 The first tabla performer was Pt. 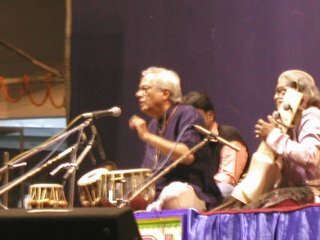 Anindo Chatterjee. George said he is one of the top 3 in the world along with Ustad Zakir Hussein and Pt. 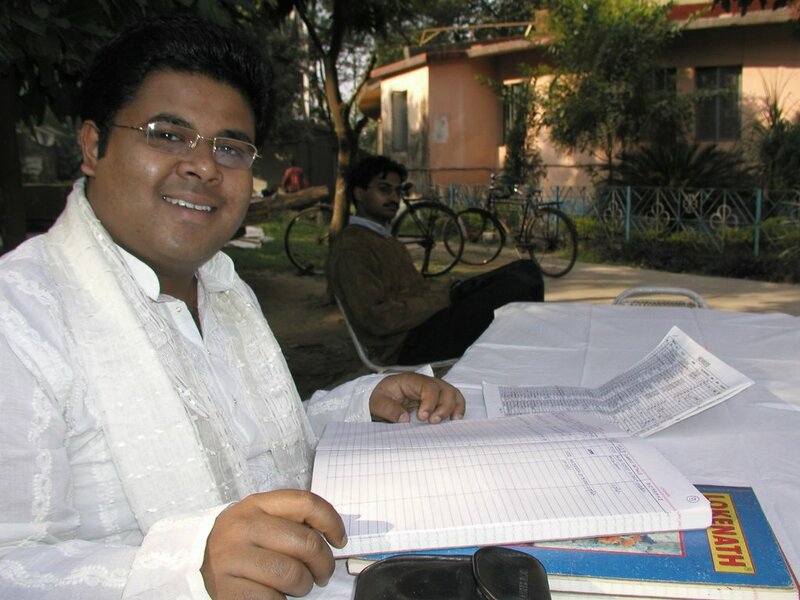 Swapan Chaudhuri. I sit here now trying to find the words to describe his playing but nothing does it justice. It is like trying to explain a Monet painting over the phone. The ingredients of his playing were speed, clarity, relaxation, dynamics, and flow. When he played, his drum did not move shake or shift. It was as if he was hitting the film of air just above the head, and the drum responded. The way he ended compositions was amazing. It was as if he was jumping off a moving vehicle, doing a flip and landing on his feet in front of the crowd with arms spread and a smile on his face. It pulled applause spontaneously from our hands. The next tabla maestro was Pt. 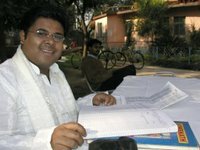 Kushal Das. He was a heavy hitter. He was a big man on the stage, and played with such power and joy. The expression on his face as he played was like the expression a mother has when her child does something precious and innocent that makes her proud to be a mother. He played the whole solo while conversing with Pt. Chatterjee, who was now sitting in the front row on the edge of his seat, happily giving praise. It seemed as if they were both playing together. The final tabla solo was Pt. Shankar Ghosh. Sitting in the front row again was Pt. Chatterjee along with Pt. 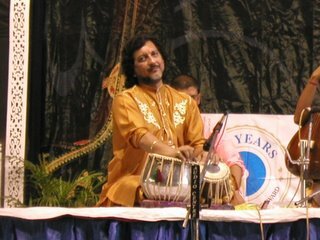 Ghosh’s son, Bikram Ghosh, another tabla great. Pt. Ghosh is older than the previous two maestros and he oozed wisdom up on stage. He announced on stage that he would play in a very rare 9 beat tal that very few players have ever played. George told me that there are only a few players in the world that can even play in the tal, and that it is even more rare to play it at a big festival such as this since it is a tal that the audience is not familiar with. Pt. Chatterjee was so excited that he was on the edge of his seat. He was fully engulfed in the man on stage, and once again, it was as if Pt. Ghosh was playing just to him. His playing was not flashy, or blazingly fast, (although he did flurries to prove he is more than capable), but it was like he was painting the air with the sound of his drums. Since the tal was so unfamiliar he was speaking the bols before almost every composition. When he recited the composition he was animated and visual. He even equated one composition to the sound of a train and when he hit the ‘tun’ stroke it was like the train whistle was blowing. He ended the festival and when it was over everyone came down and crowded around him, touching his feet, (a sign of respect) and praising him. I stood back and watched the maestros leave and then quietly walked home with a smile on my face. As I left the stadium I noticed a lady walking in front of me. I thought it was strange to see a woman walking alone at night. My pace was quicker than hers and when I passed I heard a little voice say, “Excuse me sir, are you going to the Ramakrishna Mission?” I said yes and then she asked if I would walk with her. She said her husband and brother left a while back and she is afraid to walk alone. I was more than happy to. I walked with her past the place where I was staying and helped her get a rickshaw. The whole way she said she was so happy that I was helping her. The last thing she said to me was, “It is Gods wish that you are here, thank you.” I walked home and went to bed with a happy heart. Thanks a lot Jhon. 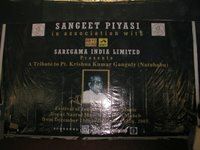 I am very happy to learn Sangget Piyasi Festival Day 1.You have written like I am watching the festival.I am the unlucky student of great Pandit Samar Saha. 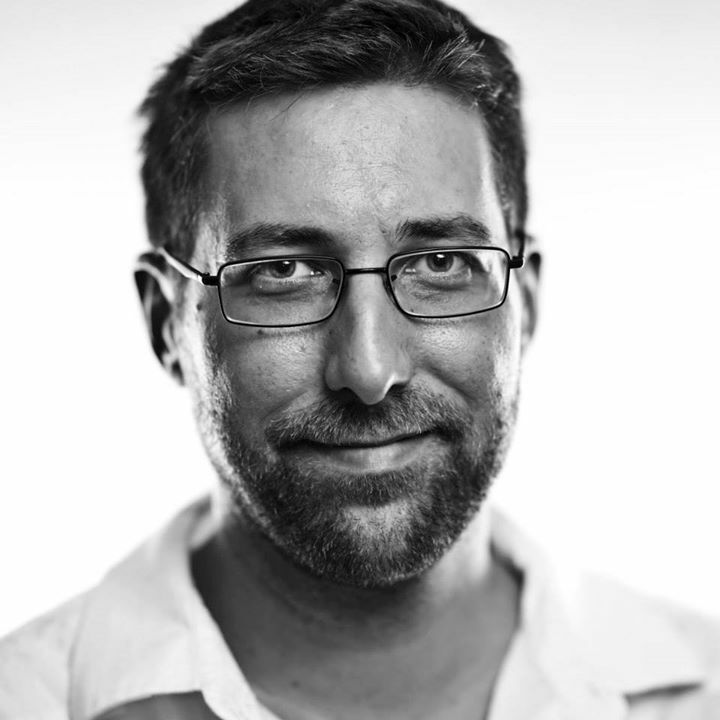 I have learnt few ( only four years) from him. From Dhanbad to Culcutta I did my journy to learn Tabla only for the Great Smara Saha.Can u share some of his play.I'll be ever greatful for that. 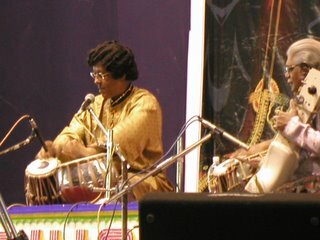 If death come i prefare death after playing Tabala of Pandit Samar Saha (My Guruji). presently i am working in Coal India Limited at Orissa. How is Babia?